I guess it doesn’t take a lot more explaining but here’s another cuddly little friend for you all. Cut out your giraffe, the same way you cut out your elephant. But now, you’ll need to make sure and add your ribbon to the neck, as well as the tail. Then pin right sides together, with lots of pins. Because remember……the minky slides around a lot. Sew all the way around, leaving a 3 inch opening along the back. Turn right side out, pushing the legs and head out with the eraser end of a pencil and stuff full of batting. Hand stitch that opening closed and you’re…….. There are SOOO stinkin’ cute. I just love them. I can’t draw worth anything. Is it possible to attach your templates? Absolutely cute! I linked again! Love the animals. Will make them for friends having babies next month! Thanks for sharing. love your ideas, and your blog! do you have a tutorial/pattern suggestion for the little boy’s ties? Hi Ashley. I love all of your cute ideas. I have a craft idea to run past you though because I haven’t the slightest idea how to execute it, but REALLY wanna try to figure something out for my YW for a camp craft. I read somewhere about pillow cases with an extra pocket for scriptures to remind the girls to read their scriptures before bed, or whatever. I would love to make these for the girls and let them decorate them as part of crafts at camp, but I don’t know where to begin with a pattern at least for where the extra pocket would go, or where it would be best. can you help me? thanks! these are really cute i am making them for my cousins that live in the U.K and they are so light to send. Hey do you have a pattern for a diaper bag. I made the giraffe today. It turned out SO cute. And I was happy to get rid of some scrap material and ribbon. The only thing I did different was that I double stitch the entire giraffe and then triple stitched all the ribbon parts. Only because my 7 month old love to tear things apart and I didn't want her to pull off the ribbon and try to eat them. THANK YOU! So cute! 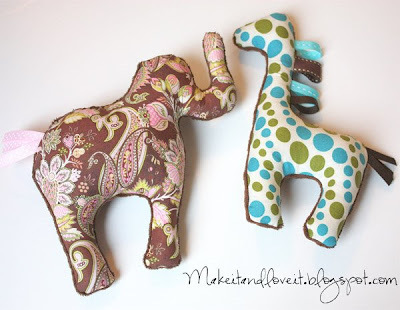 Is there any way to get the pattern for the elephant and giraffe? Would you allow me to make some to sell in my Etsy shop? Love it! Sorry, the tutorials shared on this site are for personal use only. Please refer to my FAQ section for more info. Thanks! do i have to use minky fabric or can i use any fabric? You can use anything……the minky just makes it super soft. Do you have a template for the giraffe?? I’m not very good at free hand drawing and this is soooooooo cute! I really want to make one! :) Thanks! 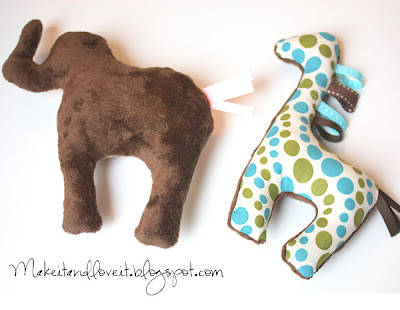 Yesterday’s post and the other links bring me to something completely different than the elephant and giraffe instructions. love this tutorial! It was featured here: http://www.plushiepatterns.com/giraffe-plushie-pattern-by-make-it-and-love-it/ thank yo so much for sharing!